Daran Wankum of Merriam Kansas has always wanted to be a U.S. Marine and follow the footsteps of his grandfather, reported KBMC 9 of Kansas City. Unfortunately, at age 18 and before he could get the chance to ship to boot camp, Wankum was diagnosed with a massive tumor located in the center of his brain. “I didn’t think at all. I just stopped the car and started crying, that’s what I did for 5 minutes,” Wankum told KMBC. His future seemed shattered because he knew this was a disqualifying factor for entering the Marine Corps. However, the Marine recruiters that he had become well acquainted with were not going to give up on him when he needed them most. KMBC reports that the recruiters from Wankum’s area stood outside of his hospital room on the day of his surgery, guarding him as he recovered after his risky procedure. His bravery and perseverance attracted attention at the top. There have been few Honorary Marines who have earned the title throughout the service’s history. 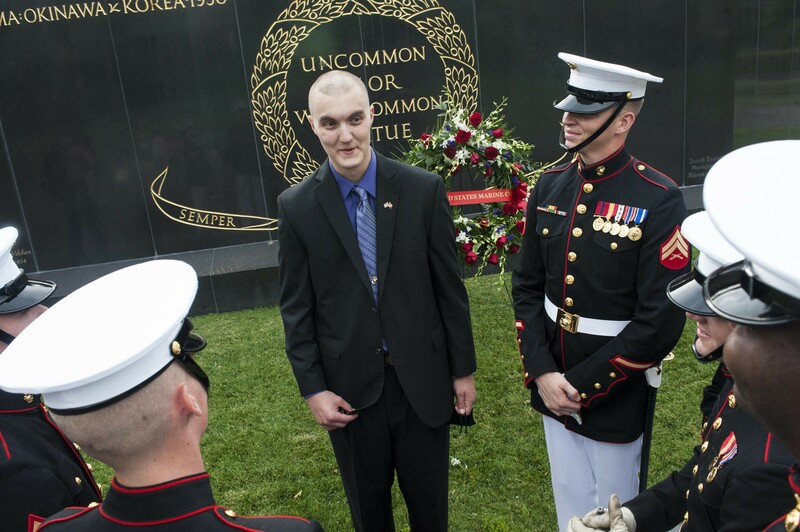 It is an honor given only to civilians that exhibit extraordinary commitment and contribution to the Marine Corps.